Combo includes the Mustang Junior Steer Head (12" horn span) and Mustang tripod steel junior stand(27"x14"). 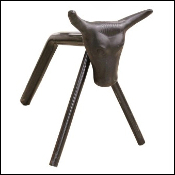 The Junior steer head is available in Pink or Black. The stand is available in black only. Includes all hardware and also includes rods to use the head with a bale of hay instead of the stand if needed.